The ultimate herbal combination in a sugar-coated tablet, invaluable to calm and relax dogs suffering from excitability, apprehension, phobias or hyperactivity. Widely used and particularly effective for those suffering from noise phobias as a result of fireworks, thunderstorms or gunfire. Does not cause drowsiness or impair normal behaviour or performance, making it suitable for those who just need to be settled for showing, travelling, training or obedience work. Given before a journey this tablet will calm nervous travellers but is also ideal if new surroundings and situations cause apprehension or anxiety, making it a useful training aid for young dogs being introduced to the show ring as well as thunderstorms, fireworks, visits to the vet etc. Under veterinary supervision Scullcap & Valerian tablets are used in the control of epilepsy, often in conjunction with orthodox anti-convulsant drugs. Can be given from 8 weeks of age. Also available in 200 and 500 tablet pots. 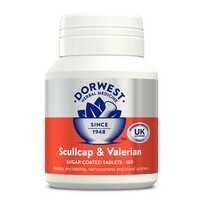 How Many Scullcap & Valerian Tablets Do I Need to Give? For use on singular occasions: Give 12 hours and 2 hours before the event using the higher dosage rate. Valerian Root Extract 5:1 50mg; Mistletoe Extract 3:1 50mg; Scullcap 30mg; Gentian Extract 2:1 24mg.